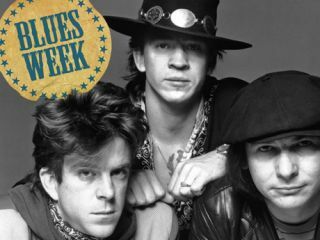 Blues Week rolls on at MusicRadar. In addition to all of our amazing content which you can find right here, we now bring you an in-depth discussion with two of the people who knew the late Stevie Ray Vaughan better than anybody, his blues brothers Chris Layton and Tommy Shannon, the rhythm section that was Double Trouble. When Stevie Ray Vaughan and Double Trouble entered New York City's Power Station studios in January 1984 to record their second album, Couldn't Stand The Weather, they knew the pressure was on. "We were being looked at very closely," remembers bassist Shannon. "Texas Flood went Gold, which shocked everybody. Here this little blues trio out of Austin comes along and makes good - nobody could believe it. So we had to outdo that album and prove that we weren't some fluke. We had no idea that we'd make what people nowadays are calling a classic." It was a heady time for the band. Signed just a year earlier by the legendary A&R executive and producer John Hammond, whose discoveries included the likes of Billie Holiday, Bob Dylan and Bruce Springsteen ("a brilliant man," says drummer Layton, "and we were honored to be his last signing"), the group lived it up in the Big Apple, thrilled to be working with an actual budget and in a world-class studio. "Those were during our wild and crazy days of drinkin' and druggin'," says Shannon. "We took the music very seriously, but we also took the partying seriously. The two sort of went hand in hand back then." Armed with strong originals (Scuttle Buttin', Honey Bee, Stang's Swang and the title track), along with an inspired selection of covers, including their blistering take on Jimi Hendrix's Voodoo Child (Slight Return), the band served up was a staggering set of white-hot blues mixed with imaginative touches of jazz, soul and rock. The recently released deluxe reissue features a remastered version of the original album along with previously unreleased bonus tracks, alternate takes and a second CD which documents a live concert recorded at the Spectrum in Montreal, Canada on 17 August 1984. "When I listen to the record now, I hear a band that's hungry," says Layton. "We were being given the keys to the car, and we were ready to go out and tear it up and make our mark on the world. All in all, I think we did just that." Recently, MusicRadar sat down with Tommy Shannon and Chris Layton to discuss the making of Couldn't Stand The Weather, their personal and professional relationship with Stevie Ray Vaughan and to share their heartfelt, moving reflections on the iconic bluesman they called a friend. It's been 20 years since Stevie died. Is it still hard to believe? Do you ever get over such a tragic event? Chris Layton: "Twenty years doesn't mean anything to me. I think about Stevie every day. We spent a musical lifetime of 16 years together - that's incredible to me. I feel so honored and blessed to have been a part of that. But do you ever get over it? No, I don't think so. You accept it, but you don't get over it." Tommy Shannon: "There's still a hole in my heart, and it'll always be there. I miss him so much. He was taken away so fast - I don't know if you can ever get over something like that. Even though I've learned to get on with life…[pauses] He was my best friend. I had the best gig in the world. In a second, everything changed forever." "He had this power to connect with people, and his legacy has become huge since his death. If he were to suddenly come back and see the impact he's had, I think he'd be tickled pink. It's all he ever wanted, and he achieved it." Talk to me about the last gig at Alpine Valley. What are your remembrances of that show? Layton: "It was a great. Double Trouble never really had bad shows. I'm not trying to sound arrogant, but we always tried real hard. That was a good one." Shannon: "We were on fire. We played two nights at Alpine Valley, and the second night was better than the first. We were really tight." Layton: "It's funny, though: When we got there, I started thinking about all the things that we had been through - the drugs and alcohol, the trials and tribulations - and I remember thinking, Wow, everybody's in a good place right now. We're all healthy and happy. Everybody's playing well. And then…that was that." Layton: "I was in my hotel room, and I got a call to come to our tour manager's room for a band meeting. It was something like seven in the morning, and I remember thinking, Why in the world are we having a meeting now? What could be so important? When I got there and saw that the only person who wasn't there was Stevie, I knew something bad was up. It took a while for us to get the real news about what had happened." Shannon: "The whole thing felt like a dream…or a nightmare. I remember, after we got the news, a security guard let me and Chris into Stevie's room, and when we saw that the bed was still made, that it hadn't been slept in, that's when it started to feel real to me." Layton: "And what's sad is, we had so much ahead of us. There was so much more to do. We were on a real roll. After so many years of struggling and then going on this fast uphill climb, we were at this peak where we could see very clearly what we needed to accomplish. But…it wasn't meant to be. "I will tell you one funny thing about that show: We spent about 40 minutes or so after the gig just sitting and talking - Stevie and I, in a way that we never did before; about where we'd been, what we were doing, our lives - real personal stuff, just two friends talking. "Then he got up, went to the bathroom and he came back with his bags. I said, 'What are you doing?' He said, 'Well, somebody offered me a seat on one of Clapton's choppers, and I gotta go.' I said, 'Go where?' - 'cause we weren't supposed to leave after the gig; we were going to stay in a hotel. But he just looked at me very pointedly and said, 'No, man, I gotta go.' What's weird is, he smiled at me, his eyes kind of teared up and he said, 'I love ya, man,' and he walked off. That's the last time I ever saw him." Wow…That sounds straight out of a movie. Layton: "Yeah. A great way for two people to leave each other, even with the tragedy of all of it." Shannon: "You know how I told you about being let into Stevie's room? The strange thing is, when we were walking in, the radio was on and that Eagles song, the one with the line 'I may never see you again' [Peaceful Easy Feeling], was playing. I always thought that was so eerie." Layton: "There's so many things about that day and night that are…yeah, straight out of a movie." Let's go back to the time before the band's success. You guys struggled for some time to get noticed. Did you ever think that you might not make it, that the big break might not come? Layton: "Yes and no. The one thing I knew was, I loved what we were doing. Before we broke out of Texas, I always thought, We've got a great thing. We've got a family, we play this terrific music - it was kind of like newlyweds who are in love and then they strike it really big, you know? We were so in love with our own little thing; we didn't really dwell on what we didn't have." Shannon: "The most important thing was, we had passion about what we were doing. I don't think we expected it to get as big as it did. But that's the way it should be: you should always do something because you love it." What kind of musical knowledge did Stevie impart onto you? And in turn, what kinds of things did you show him? Shannon: "When I first got into the band, people told me that the sound changed. We were still a blues band, but we played more in a rock 'n' roll style. I think I pushed Stevie to rock a bit more. "As far as what he showed me…I don't even know if I can put it into words. He taught me so much. Mostly, he taught me how to believe in myself and to never let anybody tell me that what I was doing wasn't good - that if I loved it, it was important." Layton: "Stevie and I had a conversation once, and he said to me, 'You've got way more talent and potential than I think you even realize.' I think about that statement a lot. It was kind of a mentoring thing on his part. So if I showed him anything, I guess it was just my ability to give everything I had. "What did he teach me? You know, there's people that study the guitar and music and know so much about it. Stevie wasn't like that. He wasn't a student of the guitar, but he just had a natural, incredible talent. I've never met anybody who could put himself out there like he did. He wanted to put his heart and soul out there for the whole world. He wasn't a selfish player; he wasn't like, 'Look at me!' He was like the Mother Teresa of music. He had something he needed to share. I saw that early and it affected me deeply." Let's talk about the making of Couldn't Stand The Weather. What memories do you have of those sessions? Layton: "I remember being in New York and having a great time. We had a little money in our pockets and there was a tremendous buzz about us. It was exciting." Shannon: "We definitely felt like the mood towards us was changing. The record label was seeing that we could sell records. People were coming to our shows. So there we were in New York, making a big-time record and sounding incredible. "We went a little overboard on the budget, but it was just because we actually had money to spend for a change. You gotta remember, Texas Flood, as good as it was, it was like a home demo that was meant to be shopped around. [The album was recorded, free of charge, at Jackson Browne's home studio.] The fact that it got us signed and got released, and then went Gold - we couldn't believe it." What was Stevie like in the studio? Easygoing? A taskmaster? Layton: "He was always serious about everything he did, but he was never a taskmaster. He was very consistent, and he could be that way whether he drinking or snorting cocaine. Relaxed, diligent, caring - he was always the same. You never had to guess which Stevie you were going to get." Shannon: "Stevie was very cool in the studio. He didn't get rattled easily. He wanted the process of making records to be fun and exciting, just as if we were on stage. Even as our budgets improved and we could record in nicer places, his belief was that if the music sounded too much like a bunch of guys fussing over it, then it was probably no good." How much material had the band worked up for the album? Do the bonus tracks on the reissue encompass all the songs you guys had ready for the album? Shannon: "Yeah, they're pretty much everything. Stevie always said, 'Making Texas Flood was easy because we just played all the songs we'd played for years.' With Couldn't Stand The Weather, we needed to work up some new material. It was a challenge, and one we needed to rise to quickly." Layton: "We didn't have all the songs. We had worked on Cold Shot in Austin and were never really happy with it. We had it down somewhat instrumentally, but I don't think there was much consideration given to the vocals. But then we went in and recorded it in one take in New York and it was done. I think I fell asleep on the couch when Stevie worked on the vocals and put them down. "We had Couldn't Stand The Weather…Tin Pan Alley we had been playing. We never really went in with all the songs ready; we didn't want them too perfect, too sterile. We'd kind of work on stuff in the studio and see what happened." Of course, you had your mesmerizing version of Jimi Hendrix's Voodoo Child (Slight Return) (see top of page), too. Stevie, however, was reluctant to commit the song to tape. Why was that? Shannon: "In Austin, there were these…how should I say this?…'blues purists' who didn't want their blues to rock too hard. Stevie didn't want to upset those people - he knew a lot of them for years and years - but at the same time, he really loved and revered Jimi Hendrix and wanted to pay tribute to him. Even though we had been playing Voodoo Child live in concert and people were going crazy for it, recording the song was not an easy decision for him to make." Layton: "We had to talk him into that a little bit. It came down to this question: Are we going to move forward and push things to the limit, or are we going to cater to the purists and do straight blues shuffles?" Shannon: "The whole thing struck us as kind of funny in a way, because even though Hendrix took his music into all these other areas, his roots were pure blues. He listened to all the old masters, just like we did. I honestly don't know why the purists were so scared of the song. It's blues!" How extensively did the band demo in preparation for Couldn't Stand The Weather? Shannon: "Stevie's way of preparing for the record was very casual; it was more like him going, 'Hey, what songs do we know? What have we been playing live that sounds good? Do we know such-and-such song? Yeah? Cool, we'll do it then.'" Layton: "We'd practice songs, but that was about it. If we knew we could play a song, then it was probably going to go on the record. But the idea of going into a demo studio and doing pre-production…that wasn't us." But when you were rehearsing, particularly original songs like Scuttle Buttin', Honey Bee and Stang's Swang, did Stevie give you firm directions? "Shannon: "Not really. He'd show us what he had and we'd start playing it. That was one of the great things about working with Stevie - he trusted us implicitly with his music. Every so often he might make a suggestion about a dynamic or whatever, but it wasn't like, 'Now, you play it the way I told you.' That wasn't his style." Jimmie Vaughan played on the songs Couldn't Stand The Weather and The Things (That) I Used To Do. Did you notice any kind of sibling rivalry between the two brothers? Layton: "I didn't notice anything like that. There was no attitude like, 'You got the family car before me. I'll get you, man!' Nah. When those two guys picked up their guitars and played together, it was all about music. The mood was great. Jimmie had swung into town with The Fabulous Thunderbirds and the attitude was, 'Hey, we're all in New York City together. Let's play! Let's have fun!'" Shannon: "There might have been a bit of a rivalry, but it wasn't obvious. Stevie respected his brother so much. They were never trying to outdo each other." Layton: "Jimmie was Stevie's favorite guitar player; he idolized his brother. And Jimmie played great on those songs, too. He came up with amazing ideas. The song Couldn't Stand The Weather is a perfect example: he suggested elongating the pauses in the intro, playing around with them. Originally, we were playing it kind of straight, but Jimmie made the riff kind of funky and jazzy, a little off-kilter time-wise." Shannon: "Kind of like the way horns might play it. I thought that was great." How important was John Hammond in the recording process? Obviously, he was a legendary A&R man who knew talent when he saw it, but did he make any crucial suggestions? Layton: "Man, talk about a cool individual. John wasn't the kind of record man to sit the band down and give them a bunch of orders and directions - he was more subtle than that." Shannon: "I remember he'd come to the studio and he'd sit there and read the New York Times. Sometimes we wondered if he was even listening to what we were doing. So one day we recorded a first take of Tin Pan Alley - actually, we were just testing out mics and sounds more than anything - and when we were done he closed up his newspaper and said, 'You'll never get it any better than that.'" Layton: "We were a little thrown for a loop, so we said, 'Well, we were just getting started, John. We know we can do better.' And he said, 'You're certainly welcome to try, but what I just heard is the total essence of the band.' And he was right! That's the version that made the album. He was one cool cat, John Hammond. Such a gentle soul. A very inspiring presence." Shannon: "Plus, I think a guy like John Hammond knew that a real artist or a real band couldn't be changed or shaped. He never tried to interfere; he just wanted to help. Like I said, he was quiet, he read his newspapers, but when he said something, you took it to heart." The live set on disc two absolutely burns. I assume there's a lot of live recordings in the vault - what made this concert from Montreal the one to release? Layton: "That was a record company decision. Yeah, there are lots of great shows that have been recorded, but somebody at the label said this was the one to use. Do I think it's good? Absolutely." Shannon: "Actually, it was Jimmie Vaughan that picked that set to release. There's so many live recordings of us, and a lot of them are great. We were tossing around the idea of putting out this concert we did for the CBS people in Hawaii, but in the end Jimmie thought this was better. It's fine with me, although I think the bass is too loud." Chris, as the drummer, you were the guy behind the action. What was it like to watch Stevie Ray Vaughan from your vantage point on stage? Were there little visual cues that you would look out for? Layton: "It was great! [laughs] Man, I had the best seat in the house every night. As far as watching him for musical cues and stuff, I sort of always knew where he was going to take a song. He didn't do anything specific; he just had a certain body language that I could read. Years of playing together does that." "We all had a musical shorthand, but it really came from Stevie. We didn't have setlists; we didn't see the need for 'em. I could tell from the way Stevie picked up a guitar what song we were going to play. I could tell by the way he finished a song which one we were going to do next." Had Stevie lived, do you think you'd all still be playing together? Shannon: "I think so. After we all got cleaned up, we recorded the album In Step, which I think is our best record. We were already talking about what to do next. The idea was to compose more structured songs and not do so many blues jams. Stevie wanted to grow as an artist, and we were right there with him till the end." Layton: "We went through hell and high water, the three of us. If Stevie were still alive, yeah, I'm pretty sure we'd still be together. Thinking about all the great music we would have made and how far we could have taken things…[pauses] You know, life just has its way with you, and there's nothing you can do but appreciate what you have at the moment. At least we got a lot of good stuff on tape." Shannon: "We were like a family, and we felt that way right up until Stevie died. No matter what happened, if we had some silly argument the day before or whatever, when the chips were down, we had each other's backs. And we had an unwritten rule about performing: when we hit that stage, we were there to give 110 percent. I think the people who saw us could tell that we meant it."